McCaskill’s Subcommittee on Contracting Oversight is holding a hearing Thursday with Department of Army officials. 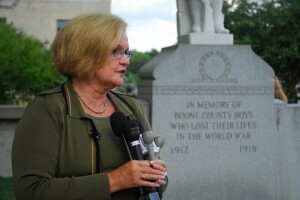 McCaskill’s subcommittee is investigating possible contracting waste and fraud at the cemetery. UPDATE: The committee has released the documents related to the hearing set for Thursday. View the hearing live at 10 / 9 a.m. Central Thursday, July 29. The initial report, which examined a small section of the expansive cemetery, found 12 graves were either found empty or misidentified. One vereran’s remains were placed in a grave that was already occupied. Two men who resigned over the controversy, former Arlington Superintendent John Metzler have been called to testify Thursday, but McCaskill wouldn’t speculate on exactly who would be at the hearing. More than 330,000 people have been buried at the cemetery since 1864.